He is one of the most respected and successful competitors that British rugby league has produced. Paul Wellens, the sport's Mr Nice Guy, will this weekend become Super League's longest-serving player. 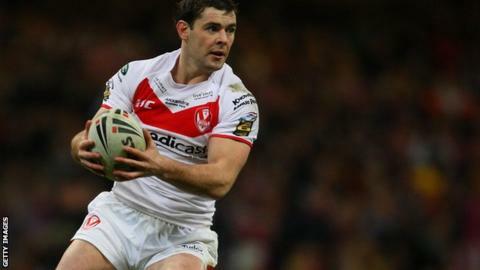 The 34-year-old will break Keith Senior's appearance record in his 414th game for St Helens at Castleford. He is widely regarded as one of the finest British players of all time. "There's no better man to take the record," Leeds great Senior says. "He is still going strong and to have performed for so many years, at the very top level in such a brutal contact sport, is astonishing." The St Helens captain is a genuine league legend. Since making his Saints debut as a teenager in 1998 he has won every club and individual honour going. Five Challenge Cups, four Grand Finals, two World Club Challenges plus Man of Steel, Lance Todd (twice) and Harry Sunderland awards. A Super League superstar every bit as loyal and dedicated as Kevin Sinfield, as unassuming and shy of fame as Paul Scholes, and with the top-level longevity of Ryan Giggs. "It's surreal to be called a legend," he says. "I'm a rugby league fan really so it's a bit embarrassing - I know who the legends are and I don't feel like one. People tell me I am and I just laugh. I feel like the player I was when I was 19 - just with grey hairs. The word legend is difficult to comprehend." The St Helens, Great Britain and England full-back has rarely sought the limelight. Ask any sports fan to name a famous rugby league player and few would say Wellens. But why? He is one of the game's most coveted players with a remarkable trophy cabinet testament to an extraordinary career at the top level. "That is probably because he has always been unaware of his worth," says fellow St Helens and Great Britain international Paul Sculthorpe. "He is the best full-back and one of the top three players I have ever played with but only ever made the press if he made a mistake. That's because his excellence was always expected. He is one of my closest friends in the game but one thing I always had a go at him for was not fully appreciating his worth." Remarkably for a professional sportsman who has played at the top for 16 years, Wellens has never had an agent or manager. "I have always looked after myself as I have never had any desire to go anywhere else," he says. "I've never even talked to another club. There was a little interest after the Tri Nations in 2004 but I had no intention of leaving as I was playing in great team with great players and for a club I loved. I spoke to a couple agents in Australia who asked if I'd be interested in moving to the NRL. I just told them I was flattered but had no interest in moving." Wellens believes that not having an agent means he has never felt pushed into a move, or felt the need to demand more money. "I have a great relationship with the chairman who understands my values. " With no desire for fame nor fortune, and lacking the ego to be talked about amongst the best, you can actually sense Wellens' discomfort speaking about himself. Sculthorpe says it is this attitude that makes Wellens a great, but admits he has given his friend a hard time in the past about not maximising his earning power or fully appreciating his worth. "Sometimes I've been critical that he's been too loyal," he says. "People always assumed he'd automatically resign at Saints. He could have made more of himself but he's just taken what's there for him all the time. That is probably why he is so loved." Sculthorpe is glad Wellens remained a one-club man but knows he could have starred in the NRL. "The Aussies have a lot of respect for him and they don't have a lot of respect for all our players. He's very similar to myself - a family man - so Australia was never on the cards. He felt if he left St Helens he'd get a nose bleed." Some have suggested that his lack of pace could have been an issue in Australia. It is a criticism Wellens has heard before and is prepared for. In fact, when asked about it, it is the only time that he actively looks to talk up his talents. "In my day, I was up there with the best full-backs in the world," he says "When I was Man of Steel that was the one time I appreciated I was good. "I understand why people say I was never fast enough to be one of the very best but I disagree. The reason behind my success is my positional play. My reading of game had to be spot on as I didn't have pace to get me out of trouble. It was imperative I read the game well so I was already in position before the play was made." Sculthorpe agrees. "He has less pace than Sam Tomkins or Billy Slater but I'd always want Wello behind me for 80 minutes. You know he will always be there." Senior says opposition sides - such as his Leeds team - would alter their attacking game-plan when up against Wellens. "He has never needed speed as he is in position before the ball is kicked. Under the high ball he is the best I have ever seen. We were always told there was no point putting a high kick up to him. His defence, enthusiasm and barking of orders was intimidating." Wellens believes the secret of his longevity is more fortune than professionalism. "I've had a lot of luck with injuries and always played in a great team that I love. So I've never had to seek motivation." His reaction to losing both his place in the team and his famous number 1 shirt to Jonny Lomax this season perhaps best sums up why Wellens is so respected. "That was the right decision for the team," he says. "If I felt I was taking a young lads chance I would retire." Wellens has kept his regular place in the squad and been used as a forward. "I always joked with him that he'd end up in the pack," says Sculthorpe, laughing. So is this year the farewell? Not necessarily. Wellens says he will sit down in July or August and make a decision. "If I'm fit and the club want me to stay I will. But if I'm not and it would feel half-hearted then I won't." Senior believes Wellens will be there forever, immortalised next to club legend Keiron Cunningham: "There will be another statue at St Helens and it will be for Paul Wellens."